The Bar Harbor Times Soup reports on a unique rammed-earth house constructed in Salsbury Cove this summer. 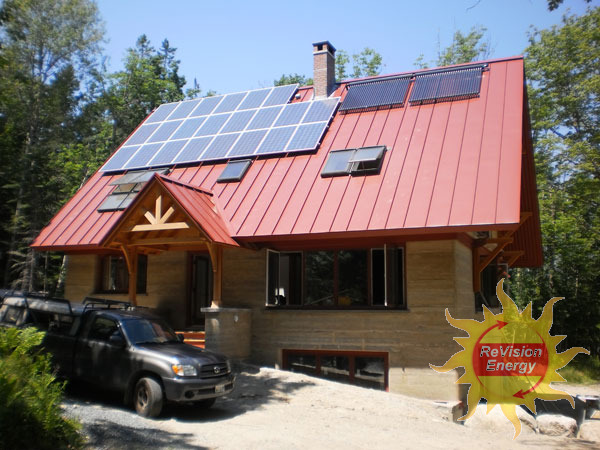 ReVision installed the solar electric and solar hot water system on the home which expects to have net-zero electric use due to high solar production in the summertime. Retired professors, Turner and Karnaky wanted their second home to be as energy-efficient as possible. Turner said she learned about the rammed earth technique years ago. After considerable research into alternative building methods in general, she said rammed earth emerged as the best choice for the first story. In 2000, the couple approached Sassaman, whose portfolio ranges from detail work to high-end residential construction, additions and renovations. The design was finalized in June 2008 and excavation began that August. … Minimum energy use is the order of the day, with the use of low-energy appliances, triple-glazed windows, radiant floor heat, and composting toilets. Turner said she expects that the photovoltaic system will generate enough electricity in the summer to sell some back to their grid provider. In the winter, the house will consume electricity to keep the house from freezing, but the energy usage should zero out, she said.